Home » blog » What Is the Difference between Pearl Barley and Dehulled Barley? We all know that barley in all of its different forms is full of nutrition but what is the difference between pearl barley and dehulled barley? If the recipe that you’re following lists barley as an ingredient, should you reach for pearl or dehulled barley? As well, if you are using a recipe that calls for pearl or dehulled barley, are you able to substitute one for another? This is the most popular type of barley available. It is small, white and pearly and full of nutrition. It is less chewy than dehulled barley since both the bran layers and the outer husks have been previously removed. It doesn’t take as long to cook as dehulled barley since it is softer and you can expect it to take about 40 minutes for it to be cooked thoroughly. This is the type of barley that is usually intended to be used by cooks when following a recipe when the variety of barley isn’t specified. Dehulled barley, however, can be substituted for pearl barley in the recipe but pay attention to the cooking time since it may need to be adjusted accordingly. This is barley is a whole grain with only the hull removed. There’s more fiber in this type of barley and it is healthier than pearl barley. It is full of fiber, which makes it chewier and it takes longer to cook. You can expect to boil this kind of barley for approximately an hour. Many people will opt for the dehulled barley over pearl barley even though it takes longer to cook. The dehulled variety provides more nutrition and health benefits so it is worth the extra cooking time. 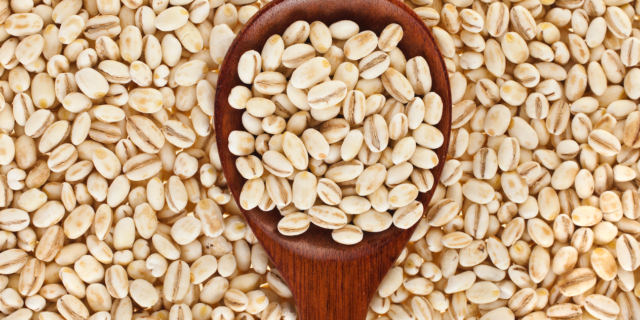 Both dehulled and pearl barley can be used for salads and soups and can also be served on their own as a side dish to accompany a main course. If you’re looking for barley and need it in bulk quantities, be sure to browse through our website at epigrain.com. We offer wholesale pricing for large orders and we have a wide variety of grains available for chefs across North America. Epigrain is where to buy wholesale organic grains in bulk.